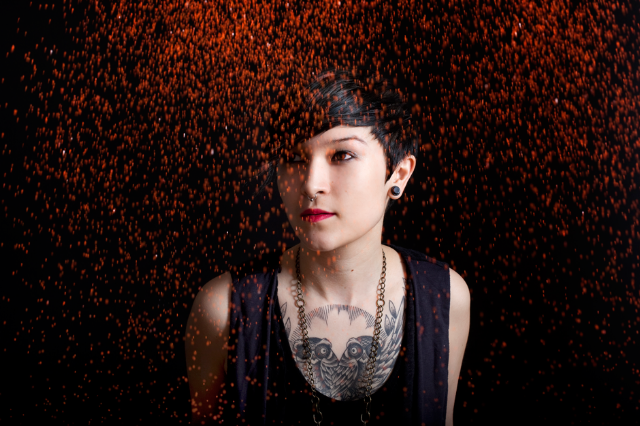 Maya Jane Coles: Dance Music’s Next Level? With ornate tattoos crawling up her collarbones and a septum piercing glinting beneath her severely coiffed swathe of hair — sometimes peroxide, sometimes pink — Maya Jane Coles keeps up a tough, yet whimsical exterior. Like many of her peers in London’s house-music scene, she’s partial to flat-billed Starter caps, but she’s also been known to rock a high-collared cape made of orange Damask and pair it with a fat, silver chain dangling a Space Invaders “Game Over” pendant. She’s little bit street, a little bit New Aesthetic, which is funny, because Maya Jane Coles’ music mostly has been praised because of its fealty to old-school deep house, with rich organ bass lines and supple grooves. Her new DJ-KiCKS mix CD, however, shows that Coles’ music can’t be boiled down so easily. Sure, some of the mix is given over to tracks in the vein of “What They Say,” the 2010 hit that marked her arrival as a rising star, at 22 years old. But the set also accommodates brooding, melodic techno, tuneful indie dance, and the wonky oscillations of Virgo Four’s 2011 standout, “It’s a Crime (Caribou Remix),” often shoehorning together such disparate styles with a kind of blunt elegance. And the session’s final third goes deep into the broken rhythms and R&B samples of cutting-edge “bass music” — the subgenre-that’s-not-a-subgenre currently congealing in the margins between dubstep, house, and techno. In conversation, Coles is cool as a cucumber, with a voice just as soft, often trailing off into mumbles. Her enthusiasm is obvious, though, especially when talking about the music itself — you get the sense that while she’s thrilled by the rapidly expanding opportunities she’s being afforded, she really just wants to get back to the studio. “I’m really bad at describing this kind of stuff,” she avers, referring to the specific sound of her music. But she seems equally confident that the music will do the talking for her. How was Miami [where Coles performed for both the Winter Music Conference and Ultra Music Festival]? It was one of the best weeks of my life, actually. Everything — all the gigs were amazing, I was with all the right people at the right places at the right times. Just had a total blast. I’d hyped it up so much in my head, I worried that I wasn’t going to have as much fun as I thought I would. I’d played in Miami a couple of times, at the Electric Pickle, but I’d never been to the WMC. That was my first time. I’ll definitely be back there, a lot, I think. What was it like playing Ultra? I didn’t actually get to see the festival itself or spend any time there, because I had another gig that day, unfortunately, but it was a really good vibe playing. I wasn’t sure how it was going to be. A lot of people are like, “Oh, Ultra, it’s very commercial, ugh,” but for me, I loved it. It seems like they took a chance on more underground artists this year. It was crazy being able to just play what I play, more niche, underground stuff compared to everything else that’s going on at the festival, yet still have quite a crowd there and a lot of people really getting into the music. I guess that’s quite a big step for a festival like that. I take it you must be playing more festivals these days; how does that compare to club gigs? It’s a completely different vibe. It totally depends on the festival, I guess. This coming year is my first summer where I’m literally doing dozens of festivals, in loads of different countries, and at outdoor events. It is definitely different. One, you’re playing to so many more people than you would be in a club, where there’s a small line-up, where everyone is there specifically to see who’s playing on that night. Whereas at festivals, it’s a really mixed crowd. You get people who just happened to find themselves at that stage or that tent at that time, for no reason. They’re hearing new music, being exposed to new stuff. It’s nice to feel like, at the same time as pleasing people who are there for the music, you’re also getting to educate people. Do you find yourself playing different kinds of sets at festivals? I don’t really plan my sets. There are so many factors that contribute to how my set is going to sound. I don’t think to myself, “Oh, this is a festival, so I’m going to play a set like this.” It’s just whatever the vibe happens to bring out of me, really. Things like, okay, it’s an outdoor festival in the sun and there’s 3,000 people there, you can go one way; you could be playing a 3 A.M. set at a massive stage with 10,000 people, and it’ll be a completely different vibe. You could be playing a stage where it’s just 100 people in a secret forest or something, and that would be a completely different vibe. Your mixing on DJ-KiCKS is really interesting. You tend to get in and out of tracks quite quickly, getting the most out of each one and then moving on. I like to weave in and out of a lot of different stuff with very big contrasts in moods and emotions. I really go up and down, if you know what I mean. I want each mix to be quite memorable — you can blend in and out of tracks in a way that you don’t even notice, but the vibe will still be, say, such a drastic change. I want my mixes to be something that, if you’re standing on the dance-floor or in a house, and you’re having a conversation with somebody, and you’re so into that conversation you’re not really listening to the music, you’ll still hear everything that happens in the music. Like, you don’t necessarily have to be listening and focused to know what’s happening. You do a lot of harmonic mixing, too, following one key from one track to the next. That’s important to me. It’s because of my ear: I come from a musician’s perspective. I was a producer first, and I always wrote music first, so I guess that’s kind of reflected in my DJing. I did spend a lot of time planning and preparing for a mix like the DJ-KiCKS. Each transition, and fitting the right tracks together, is really important. It’s a DJ mix, and it’s got to flow. To a lot of people’s ears, the mix itself might be going through too much different stuff, with too much going on. But as a producer, I like to experiment with a lot of different sounds, and I want that to be reflected in what I play. I get really bored just sticking to one thing and being safe. Even though you’re best known in a house-music context, I was struck by how the mix takes in a lot of so-called bass music, with swung rhythms and broken grooves. Because I produce stuff under the Nocturnal Sunshine alias, and one of the tracks is an exclusive under that name, it’s my opportunity to go into that territory a little bit. My mixes generally revolve around four-to-the-floor stuff, and there are so many different directions you can go within that. But especially with it being a DJ-KiCKS mix — that’s never just been house music, or house, and techno — it was an opportunity to show another side of me. One of the tracks that really stuck out was the one from the Losing Suki label. “No More Stories,” by Last Magpie. I think it’ll be out quite soon. There are a few tracks like that which I got to use exclusively for the mix. Finding fresh, innovative music like that — there’s so much underground stuff that’s in between house and dubstep and drum and bass and garage. Kind of like a whole new subgenre, or a whole new kind of scene emerging, based around that stuff. Especially in the U.K., that’s what I’m finding really exciting at the moment, so it’s cool to have a few of those tracks to use. It seems like a really exciting time for that sort of material, which there isn’t really even a name for yet. It doesn’t really need to have a name for these kinds of things, because then it just gets totally rinsed, and people move in and out of phases. But there’s so much exciting stuff going on at the moment. Fresh. Are you continuing with Nocturnal Sunshine, then? That’s a project I always keep running on the side. I guess it is quite a specific thing I was going for when I started making the Nocturnal Sunshine stuff. Nocturnal Sunshine is actually the name I used to use for all my productions, but then when I put my first releases out I decided to use just my full name. But I always wanted to keep that name for something. So when I started making the sort of dubsteppy, 2-steppy, bass vibes, I decided to take that alias on for that. really inspired a few years back when I first started going to nights like FWD and DMZ in London, and heard what was dubstep back then, those emerging sounds. And I just wanted to create my own take on all of that. You just did a single for Hypercolour with a few bass-music remixes as well. The Hypercolour boys seem to be really picking up on all that stuff at the moment. It’s a good team of fresh artists doing stuff for them. It’s cool to get remixes from people like T. Williams, Youandewan, and Dark Sky, who’s done another one as well. You’ve done quite a few remixes yourself — are you starting to have to turn down requests? There’s always been so much that I’ve had to turn down, not necessarily because I don’t like it, but it’s just that in the last year there have been tons of requests. Now, I’m focusing on remixing a lot of full-vocal stuff and more song-based stuff that’s outside of the club world. I find it more exciting working from that angle, more of a musical angle. I guess the stuff for my album is moving further away from the club world. I really like the remix you did for Little Dragon, which was sort of in that vein. Oh, cool. That was one of my favorite ones to work on so far. I just work really well with songs and vocals. I like taking stuff in a polar opposite direction from the original track, or just putting my own stamp on it. It’s fun remixing stuff for the club, but when it’s already a four-to-the-floor house tune with just little loops and snippets of sound, there’s only so far you can take it. When there’s more elements like full vocals and instrumental parts, there are so many more directions you can take it in. So your album will be going more in that song-based direction. I guess that’s what I originally got into production through. I didn’t get into production through house and techno and club stuff. That kind of came in when I started DJing, when I was 17, 18, and I started buying records and going clubbing and partying. But before that I was making music just, you know, writing song-based stuff and hip-hop and trip-hop and dub and that kind of thing. My album, which is pretty much finished now, is my opportunity to show people what I’ve always been about musically and what I was doing before the club stuff. Do you know when it will be out? There’s no set release date yet. It’s been a constantly evolving, moving project, and it’s only recently that I’ve just about put down the final, finishing touches. I’ve got lots of offers [from labels], but I’m still in the process of deciding who’s going to be best to give it to. It will be this year, though.